Heaps of sea creatures glow to produce light—often in order to see in the murky depths. 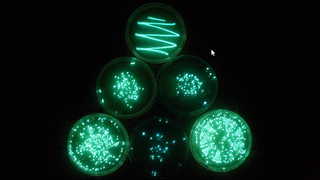 But scientists have discovered that many bacteria glow for a very strange reason; they want to get eaten. A team of researchers from the Hebrew University of Jerusalem have discovered that the light emitted by marine bacteria attracts predators—usually zooplankton—which eat them, but aren't able to digest them. Because they don't get digested, the bacteria continue to grow, and over time light up the zooplankton in which they find themselves. In turn, predator fish are attracted to the zooplankton and eat them.